I am noticing things about some of my older props. Originally made with flying carpets, apparently, it is designed to sit on couches and chairs..
Perhaps you love it. Great. I have made a second version (fig. 3). but this way you can place it on any number of things. I have made this mesh (fig. 4) a little smaller. As a bonus, the smaller floor pillow is also getting 12 different overlays. That's right bubbies - 12 new styles on the smaller mesh. 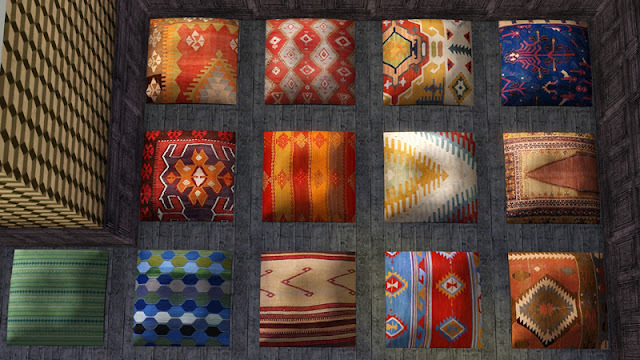 from the already released rugs/ottoman sets. Yup, you're counting correctly - the first one is CASt-able, so 13. I can count too - sheesh. You won't need to ditch the old ones as this is a complimentary set. Unless you don't like floating and huge pillows. You might notice something new in some of the photos. It's a sneak peak at what's to come. If I haven't credited it - it's probably talked about here. Okay - until next year . . . fer real this time. Love ya, but I have got work to do. Had a cold and it's eaten up some of my precious vacation. So no hugs this time. Germs and all. Besides - last time you nearly squeezed the life out of me. May all our 2011 be a good one. Pictures 1 - 3 - Aikea_Guinea - Wallpaper w/EA pattern. Can I just say how much I LOVE your style of writing? I've been meaning to mention that. Thank you for these pillows, as well! 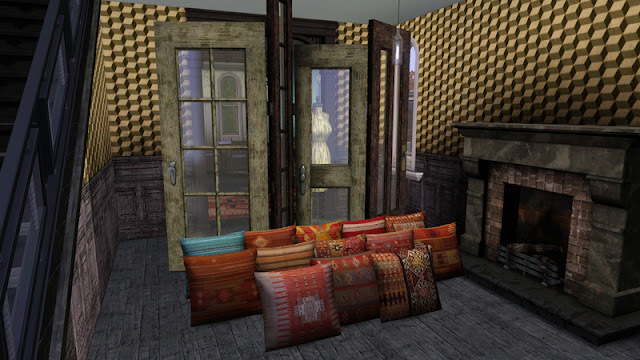 This is great, yesterday I was decorating a room and used the big chair pillow and noticed the floating a bit (lots of pillows by other creators seem to have the same problem), not a huge deal but it's nice to see it fixed! 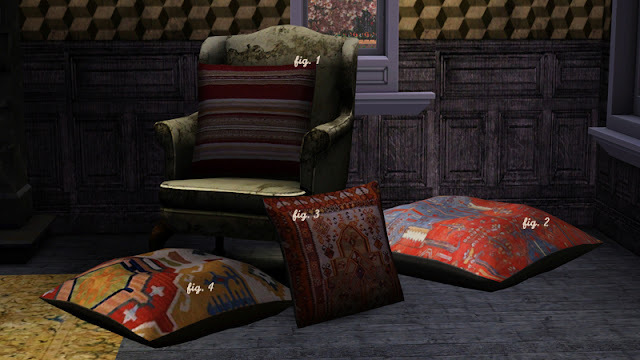 I do prefer downloading floor pillows now because then you can always use different OMSP's to adjust the height. The new textures look lovely too, and I'm very excited about the new project (the door table looks so awesome <3)! bau I am so glad you didn't stay away until the new year. These pillows are awesome and I am on the edge of my seat until you release that door screen.